They say that when a caterpillar is ready to turn into a butterfly, it begins building a chrysalis. 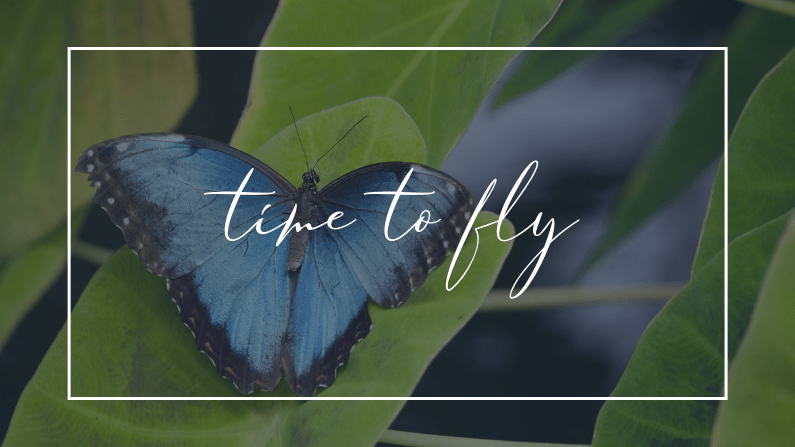 It doesn’t sit around pondering if it’s time to change, or wondering if it’s worth having wings… it just gets down to the business of transforming. Have you seen this? It’s fascinating as hell. While the caterpillar’s in there, it’s total surrender. It turns into total goo (I’m sure there’s a technical term, but I’m not a biologist), and doesn’t fight the transition… nature takes her course, and out emerges this beautiful butterfly. We’re a lot like that. We’re going about our business, and doing our thing, and then suddenly something shifts, and we’re not content being caterpillars any more. But that transition stage… the one where we turn to goo… I don’t know about you, but I spend a lot of time resisting the transformation, feeling gross in my gooey state, and I’m often filled with fear of the unknown, or doubting the process, or feeling my faith shake. Because when it’s uncomfortable, it’s easy to feel alone – it’s just you in that chrysalis… or is it? I’ve spent the last few months in a chrysalis, turning to goo, growing some wings. And while I’d love to tell you that I handled it gracefully, like the noble caterpillar, it’s been a lot of squirming and resisting. But this time, I’ve also felt very supported. Lucky for me, my spiritual team doesn’t take up a lot of physical space, so that chrysalis fits them all in just fine. I’ve been working with angels for protection, and justice. I’ve called on Green Tara for strength and courage, and Ganesh to help me break down obstacles. I’ve been held. And I’ve transformed. Things that once brought me shaking with rage or shutting down with anxiety are now leaving me mildly annoyed on one end of the spectrum, with a couple of hot tears on the other end. The extremes are lessening as I grow. During my anxiety recovery a few years ago, I remember knowing that things were getting better, but I’d gotten so used to them being hard, that I was afraid to admit that. I was cautiously optimistic. And there’s a bit of that happening now. I know that I’ve got my wings, and I’m giving them the occasional flap, but I haven’t trusted my ability to fly yet. It’s coming though. I can feel it. Because with the support of these light beings, and the transformation I’ve experienced, I have also been working on reclaiming my power. Standing in my truth. Honouring my worth, my time, my investment. No longer running and hiding because it feels easier and safer. I’d rather be uncomfortable in my integrity because I’m fighting my old flight patterns than compromise what I know to be right and true. It’s time to test these wings. I can’t wait to see where they take me.